Eight motivated and excited students from Chanleas Dai Junior High School returned to school during their holidays to participate in the Lego Mindstorm – Green City workshop. The workshop was part of a Community Development program run by PEPY and it was offered to all students and only 8 males applied. Students designed their own robots making an excavator, truck, and forklift. During the three weeks, for 7 hours a day, the group learned how to build a model, and program it to achieve some set tasks. Students individually brainstormed ideas then formed groups to plan, design, build, and program of a functioning robot. The Green City model was used last year but this time the students expanded on the concept and created their own community, incorporating their own ideas. Students experimented with speed and distance which encompassed research skills such as making predictions and drawing conclusions. Students developed their critical thinking, problem solving skills, and ability to work as a team as the robots needed to achieve certain tasks like lifting items, transporting and moving items in a particular way. The robots were activated by different sensors such as; touch, light, sound, and ultrasonic. Many tests were performed, results explored and questions asked until the students had them operating successfully. Students learned how to film their robots and produced videos. This allowed them to show their parents and family members at home what they had been working on. 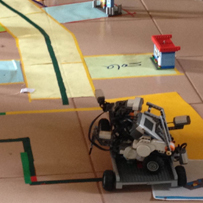 On the last day of the workshop, students invited family and friends to come and watch the robots perform their tasks. The students had a lot of fun exploring the world of robotics, all while building their skills in key learning areas such as: science, technology, engineering, maths, and literacy. They all showed great enthusiasm and commitment to the process of building and programming the Lego. Seeing all the robots operational brought a lot of satisfaction to the students.